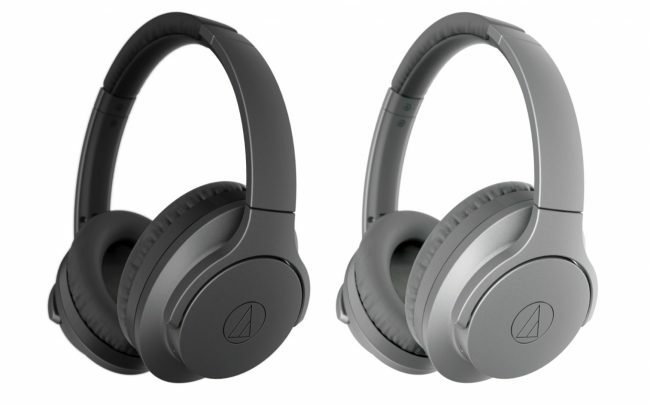 At CES 2018, Audio-Technica unveiled a new wireless and active noise-canceling (ANC) headphone in the form of the ATH-ANC700BT QuietPoint. The Bluetooth-ready ATH-ANC700BT QuietPoint headphones utilize Audio-Technica’s newest and latest ANC technology as well as touch controls on the ear cups. Let’s take a peek at one of Audio-Technica’s latest Bluetooth products coming this March for $199. Audio-Technica’s QuietPoint ANC technology uses a four-microphone multi-feedback system. This aims to provide greater noise cancelation in a wider frequency range in the low through midrange frequencies than seen in competitor ANC designs. When connected via Bluetooth (4.1), users can the headset’s touch controls on the ear cups to answer calls, control volume, and play, pause, fast forward or rewind music tracks. When connected via the included 3.5mm cable, users can experience Hi-Res Audio compliant sound via the headset’s 40mm headphone drivers. The ATH-ANC700BT’s battery gives you up to 25 hours of continuous Bluetooth and noise-canceling playback on a full charge. Coming in gray and matte black, the headset also sports a foldable design to allow for easy transport. The ATH-ANC700BT comes packaged with a soft carrying pouch, USB charging cable, and a 3.9-foot 3.5mm cable for use with the headset in non-wireless scenarios. † Images and Specs gathered from Audio-Technica’s CES 2018 press release and website.